The distant sparkle of algae is coming into focus. Interest is growing exponentially and a handful of companies are planning the leap from research to commercial production of algae-based fuels. In the years since the discovery of significant concentrations of lipids in certain species of algae, estimates for the potential of the single-cell water-borne plant have varied wildly. What is agreed is the substantial potential for algae to become a valuable resource in the portfolio of second generation biofuels. The tiny plants can produce at least 15 times more oil per hectare than alternatives like jatropha, rapeseed and palm, and are 20 times as productive as corn and soy. Today, high-end food supplements are still the main algal product, but some estimate their fuels could compete with petroleum at US$60 per barrel. But with the range of technologies available and a ground swell of R&D investment cash, confidence among developers is high that algae-derived biofuels will soon be able to compete with fossil fuels. The environmental advantages of algae – which absorb CO2 along with nitrates and phosphates – are coupled with the promise of commercial yields of high quality biofuel. An indication of this potential is given by the growth of interest in the sector. According to Otto Pulz and his colleagues at the IGV Institute in Potsdam, Germany, the 100,000 known strains of microalgae in the world are currently being scrutinized by at least 200 companies with big plans. At first count, in 2007, there were just five. ‘Mainly in the U.S., it’s concentrated there,’ he says, with European interest next. Bill Gates and his Cascade Investment LLC jumped behind Sapphire Energy of San Diego, helping them raise ‘substantially more than $100 million’ by September, along with ARCH Venture Partners, Wellcome Trust and Venrock. Sapphire means to produce 10,000 barrels of ‘green crude’ in three to five years. Solazyme of San Francisco isn’t saying who invested $45 million in their fermentation process to grow algae in the dark. Their target to sell diesel is between next year and 2012, although testing by the global standards-setting body ASTM International has already cleared their diesel for performance and safety. The European Union is throwing €2.7 billion behind algae over seven years, and is including algae for the first time in the 2010 calls of its Seventh Framework Programme. Individual countries, particularly in Western Europe, are supporting research and expansion as well. Nonetheless, some government-backed programmes have failed to live up to expectations. For instance, the Japanese government’s Research for Innovative Technology of the Earth programme spent $100 million studying closed algae systems, but ultimately gave up on it. 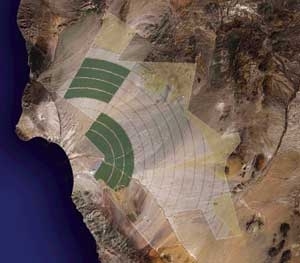 While in 1996 the United States closed its US Aquatic Species Program, which led research over three decades at two 1000 m² open-pond systems, before concluding the technology was too expensive for large-scale production. So-called open systems stand exposed to the elements and nurture algae favourable to the local environment. There’s a lot caretakers can do to stimulate growth in these low-cost simple systems, but not as much as is possible in the more expensive closed systems. These can cover just as many hectares, but are sealed in plastic, glass or bags and offer extensive control options. Numerous innovative designs aim to mimic the low costs of open-ponds with the efficiency and enhanced production of closed systems. Those bioreactors can be arranged vertically to maximize collection of sunlight, and also allow manipulation of pressure and temperature to stress the algae into producing more oil than they normally would. Some employ centrifuges or chemical additives, and many more tricks have been tested. Bioreactors are preferred for colder climates, and also allow specific control over the carbon dioxide gas feed. The cleaner the carbon, the ‘happier’ the algae, and the exact makeup of the carbon source can lead to the appropriate selection of algae for the best production. A harvest of 300–400 ppm is considered healthy. That string of energy then has to be turned into something denser that’s biologically stable and won’t break down. Dehydrating the harvest is one of the many challenges researchers are working to overcome. Another approach to improve yields is selective genetic engineering. While some open pond processes accept the algae that appears and grows naturally, most companies carefully select the species with the most desirable traits. Some others attempt to make their own. ‘We are manipulating the genome,’ says Dominique Duvauchelle, CEO of Eco-Solution, ‘When bacteria lives, it divides in two. And sometimes when this happens you can select the mutations,’ he explains, revealing by way of illustration that some of the species with the highest concentrations of lipids have very hard cellular walls, which hinder efforts to extract the oil. It is therefore desirable to select particular mutations with high lipid content and weaker cell walls for future generations. ‘If you have a continuous culture you can add some new mutations at any time,’ Duvauchelle adds. Their ‘high throughput platform’ accelerates those divisions and the production of variants. Located outside Paris, his company was founded in 1999 and has raised €9.5 million from private investors. Their discoveries, like some others in this sector, have gone to aid treatment of industrial and municipal wastewater as well as soil decontamination. 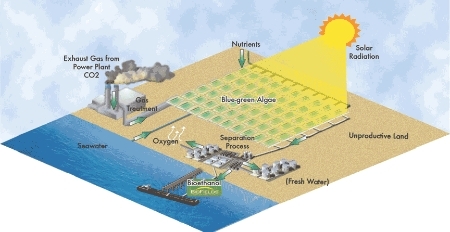 Indeed, connecting algae production to industry is a common plan, with benefits for both sectors. The algae need a steady stream of CO2 and their absorption of this gas could help to minimize the environmental impact of greenhouse gas emissions. 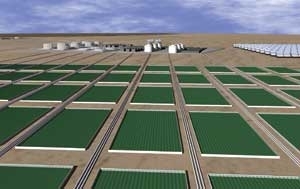 An example comes from Seambiotic Ltd of Israel, which is reputed to be the first algae cultivation operation using flue gas from coal-fired power plants. After their pilot plant went online in 2005, says chief advisor Ami Ben-Amotz, the power plant officials were not too happy. ‘Now we are in co-operation. They want to change the front gate so visitors will go into the power plant through the ponds of the algae!’ That will accompany expansion from today’s 1000 m² to a five hectare production plant by late 2009. They’ve proven the concept, he says, and algae has a place in carbon capture across the industrial world, including at Fischer-Tropsch fuel production facilities for coal-to-liquids or gas-to-liquids, which are among the world’s most potent producers of CO². Natural gas-fired power plants in the U.S. are also feeding algae. Ben-Amotz advises, ‘To get connected to the chimney is quite difficult,’ but with seven tonnes of algal health food as their main product, picking the algae is easy. ‘My way is not to find the algae, but to let the algae come by themselves. If you give the algae the best conditions they will come. They’re in the water. What they call self-selection. Then you just enrich the algae.’ Nonetheless, now that jet fuel production is a new goal, analyzing strains is a new chore for Seambiotic scientists. Within three to five years Solix means to begin large-scale production on a 10-acre (4-hectare) site on the Southern Ute Indian Reservation in Southwest Colorado. Their bioreactors will stretch skyward to maximize sunlight exposure, paid for by $10.5 million from its first round of outside funding. The Ute tribe is an equity holder in the company. Solix isn’t worried with converting their algae oil into fuel. Refineries can buy the oil and re-sell it themselves. ‘It’s essentially a triglyceride, so it’s the same category of compounds we get from soy, canola, palm, jatropha, you name it’, Willson says. HR Biopetroleum has had almost twenty years to puzzle over these problems, which may be one reason Royal Dutch Shell partnered with it to form Cellana and build massive algae ponds in Hawaii. They are a contender to be the largest biofuel producer when their commercial plant starts operating next year and if their plans for a 20,000 hectare plant hold true for 2012. Meanwhile, GreenFuel Technologies Corp. seems on a steady course with Aurantia Group to build a 1000 m² algae facility outside a cement plant in Jerez, Spain. They intend to produce around 25,000 tonnes of algae biomass annually from a $92 million facility. The Cambridge, Massachusetts-based company specializes in capturing numerous industrial emissions in algae facilities. The exception to this young sector’s restraints of time and technology is Alganol Biofuels, which says it is ready this year to sell algae-based ethanol at affordable prices. The Maryland-based company licensed its technology last year to BioFields of Mexico, which invested $850 million last June to build a massive algae farm in Northwest Mexico. Biofields could start producing 378 million litres of ethanol a year, and intends to increase this to 1 billion gallons (3.8 billion litres) per year by 2012. Furthermore, the process avoids the requirement for dewatering, crushing or processing the algae. As leader of Boeing’s biomass research, Darrin Morgan has also noticed companies over-selling their abilities to produce. ‘It’ll be apparent in the next year who the people are who are talking about it and who are the ones doing it,’ he says. As an emerging technology with a huge potential and an even bigger demand it is perhaps inevitable that some players are tempted to hype claims for yields as they search the markets for development finance. Some claims will inevitably turn to dust as the real commercial winners emerge and some are revealed as dead ends. But with the range of technologies available and a ground swell of R&D investment cash, confidence among developers is high that algae-derived biofuels will soon be able to compete with fossil fuels.